You were suppose to use it to encase objects in a bezel cup, and you can see a doming effect. 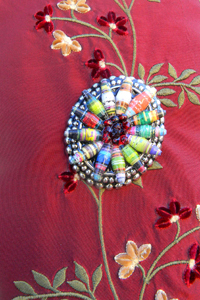 I used it instead to hold the paper bead tubes onto a brooch finding and at the same time the crystals in the center. I tried it on paper and it is drying as we speak. 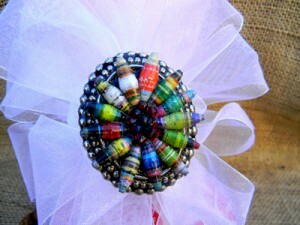 I think it will make an interesting paper bead, don’t you think? We’ll see…. Wow this one is really neat, you always have such creative ideas. thank you, janice ! 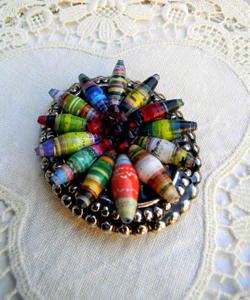 i just visited their website and it looks very interesting indeed to work with paper beads ! it leaves a lot of creatives possibilities… matter to follow! I found the effect very nice but I have not understood exactly what it is! excuse me but my English is still approximate !